Cairo University students shout slogans against the government at the university’s campus in Giza, on the outskirts of Cairo November 30, 2014. One person was killed following clashes between Egyptian police and protesters in Cairo, bringing the total death toll to two since clashes erupted on Saturday, a health ministry spokesman said early Sunday. The clashes followed a court decision to clear former President Hosni Mubarak over killings during an uprising which ousted him three years ago. Nine people were injured in the violence, spokesman Hossam Abdel-Ghaffar said, which occurred in Cairo’s Abdel-Moneim Riad square near the iconic Tahrir Square. The first man to have been killed had been shot either with live ammunition or birdshot. “He had been wounded in the clashes,” a health ministry official told AFP. 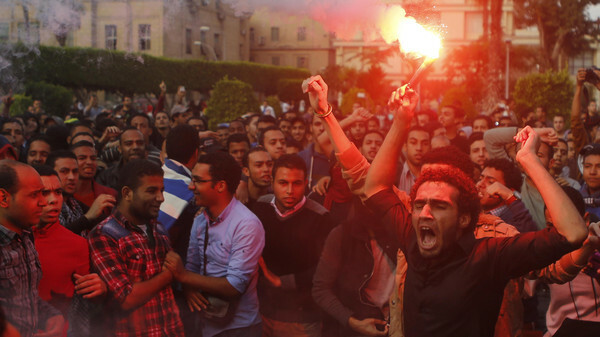 Egyptian police initially fired tear gas at more than 1,000 protesters who gathered to denounce the court’s decision. An AFP correspondent said police also used water cannons and chased protesters in side streets near Tahrir Square. Police, some in plain clothes, chased protesters on foot and in armored vehicles, putting at least 20 arrested demonstrators in vans and driving off, the correspondent said. The protest appears to have started with secular leaning activists but was joined by supporters of the blacklisted Muslim Brotherhood movement. An Egyptian judge sentenced the leader of the Muslim Brotherhood and 25 others on Sunday to three years in jail for insulting the court, a day after charges were dropped against ousted president Hosni Mubarak over the killing of protesters. The Brotherhood’s general guide, Mohamed Badie, is among hundreds of the group’s members who have already received death sentences and lengthy jail terms in mass trials criticized by Western governments and human rights groups. Earlier on Saturday, Cairo Criminal Court had also acquitted the former interior minister and top security chiefs of charges of killing protesters during the 2011 uprising. His lawyer, Farid al-Deeb told AFP that 86-year-old Mubarak could benefit from early release from the military hospital where he is being held. Mubarak “has already served two-thirds of his sentence” when time held in preliminary detention since his 2011 arrest is taken into account, Deeb said. “Under a recent legal amendment, there can be a release once two-thirds of a sentence has been served,” he said. Mubarak, his two sons Alaa and Gamal, and businessman Hussein Salem were also acquitted of corruption charges related to the export of natural gas to Israel at below-market prices.